LDFI welcomed Ambassador Mark Regev to our AGM. LDFI was delighted to host (jointly with Labour and Conservative Friends of Israel) a private meeting with Prime Minister Bibi Netanyahu yesterday. Prime Minister Netanyahu reiterated his wish for peace talks with the Palestinians. He said he was willing to talk to President Abbas at any time, any place, with no pre-conditions. He set out his vision for mutual recognition of a Palestinian State for the Palestinian people and Israel as the nation state of the Jewish people but with full civil rights for all its residents. He said to avoid the West Bank being taken over by militant Islamist terrorists as Gaza had been, he thought the Palestinian State would have to be a de-militarized state, but in an exchange with Lib Dem Foreign Affairs Spokesman, Tom Brake MP, he emphasised this was not a pre-condition and there would have to be a negotiation on how to achieve security for both Israel and Palestine. Netanyahu also talked about the threat posed to the region and the world by militant Islamists, and said this should turn the Arab states who were facing the Islamist threat from enemies into allies. 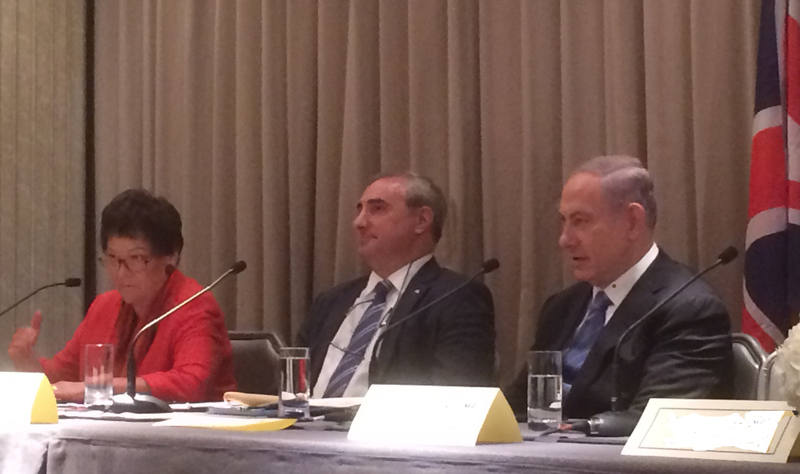 LDFI Vice President, Baroness Sarah Ludford was part of the welcoming panel (pictured above with Netanyahu and the Israeli Acting Ambassador). She spoke about the significant and strong historical links of the Liberal Party and the Liberal Democrats to the foundations of the State of Israel. 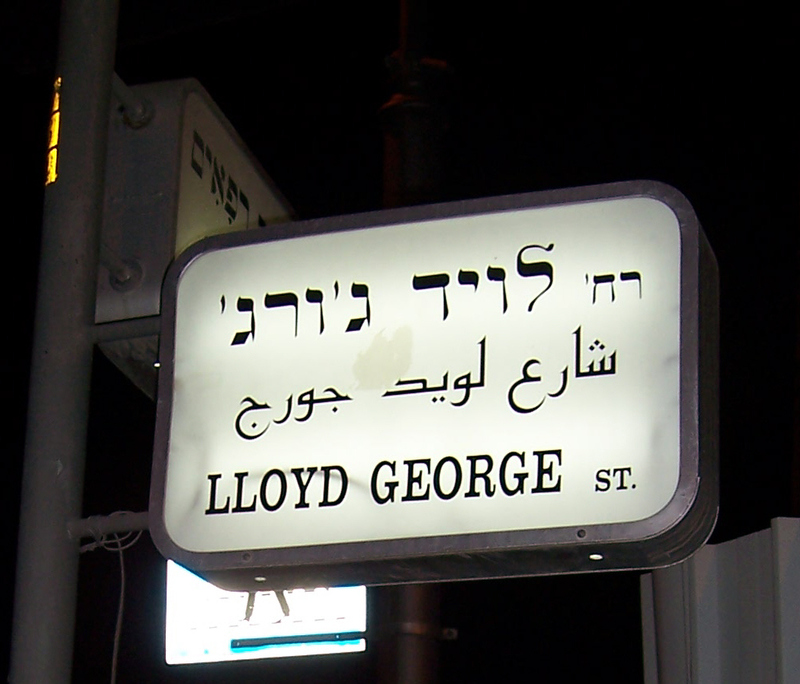 When the Balfour Declaration was issued in 1917, Foreign Secretary Balfour was serving under Liberal Prime Minister and noted Zionist David Lloyd George, who has a street named in his honour in Jerusalem. Lloyd George formed a very close relationship with the first President of the State of Israel Dr Chaim Weitzman and a picture of Weitzman and Lloyd-George together is displayed at the great Weitzman Institute. Liberal Home Secretary Herbert Samuel was the first practicing Jew to serve as a Cabinet minister and to become the leader of a major British political party. He became the first High Commissioner of Palestine and recognised Hebrew as one of the three official languages of the Mandate territory. The meeting with Netanyahu was also attended by LDFI Vice President, Lord Monroe Palmer, Tom Brake MP, Sir Alan Beith, LDFI Vice Chairman, Jonathan Davies and Honorary Committee Member, Ishvinder Singh Matharu.